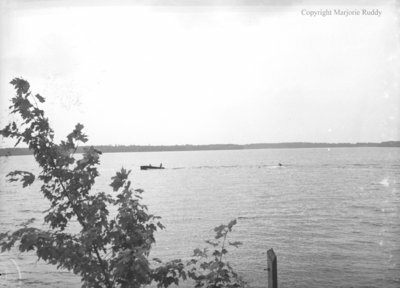 A black and white large format negative of Clear Lake, Ontario. In this view there is a boat pulling a water skier. William Gordon Ruddy was born at Peterborough, Ontario on November 25, 1914. He married Madge Anne Heard in Whitby on June 25, 1943. They had two children: Robert John Ruddy and Donald William Wesley Ruddy. William is the younger brother of Marjorie Ruddy. W.G. Ruddy and Family at Clear Lake, July 1956, Marjorie Ruddy. Whitby Archives A2013_040_286.